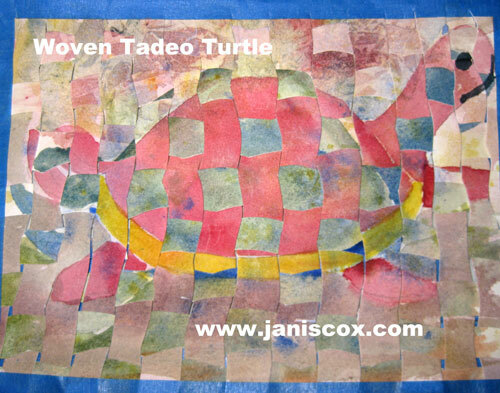 Crafting Saturdays - Woven Tadeo Turtle. Today I am showing a craft that can be modified for little ones or older ones. 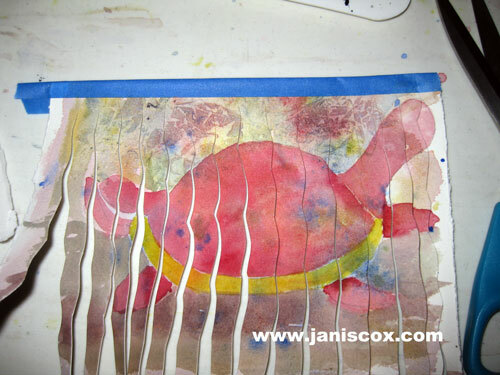 For the little ones make the paintings large and cut the strips large as well. The little ones can cut straight lines. For older children, the pictures can be more intricate. Please feel free to pin this activity. I can’t seem to get PIN IT buttons to work any more. And if you don’t want to miss any crafting Saturdays please subscribe (top right of this blog). I painted this picture using watercolours. Tempera Paint would work well too. 1. Paint two pictures that are similar. They don’t have to be identical because they could end up as a lovely design instead. But today I painted two similar pictures of Tadeo. I used complementary colours so they would blend well. 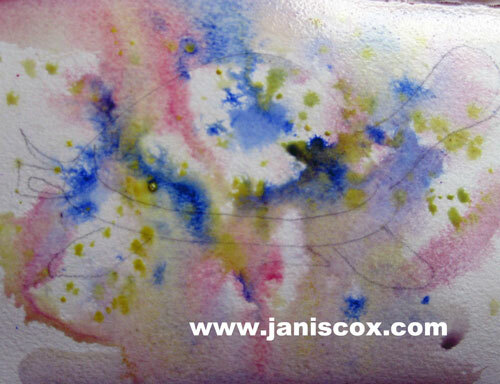 When I first paint a picture I paint the underpainting – spattering colours on wet paper – (this is not necessary for this craft but thought I would show you what I did). I then painted the first picture. For the background I used wet paint and plastic wrap to make the trees, leaves, bushes (at least give the idea of that). You can see more about using plastic wrap in Tissue Tadeo. I did the same for the second picture – so now I have two pictures. Here is the second one. 2. One picture for the frame. One picture to weave with. Now you have 2 similar pictures. One will be the frame for weaving and one will be the strips. This is cutting the frame. Notice I put masking tape at the top to warn me NOT to cut all the way through. But go right up to the tape. Next cut the second picture into strips. Cut these all the way through. 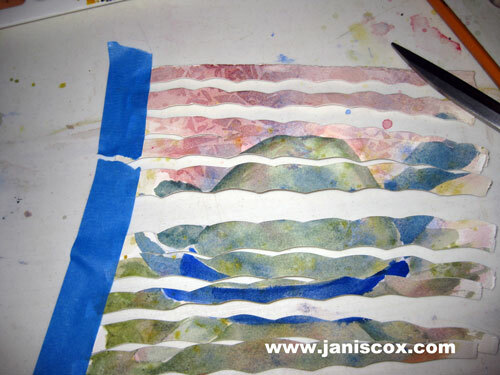 I used masking tape to show you the pieces (they kept flipping over). You don’t need to use the masking tape. Cut the strips from the second picture the opposite way to the first picture. These are the weaving strips. I also numbered them as I cut them. You could number them on the front for the little children (but I numbered on the back). 3. Now to the weaving part. This is fun. 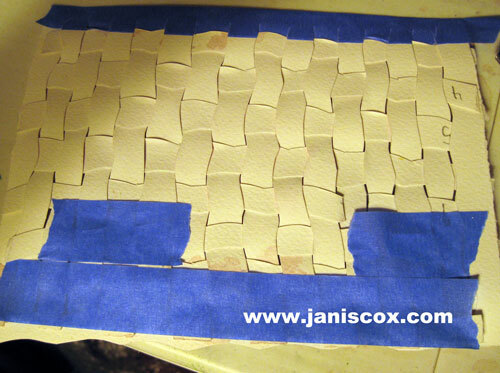 It is the under/over weaving.. You will not use all the strips. So decide which ones you want to use. I think I cut 11 and used 8 strips. Push each strip up as tightly as you can to the next one. If you want you can put a little masking tape to hold it at the end. As you travel down your picture decide whether to leave out a strip. Here I am almost done. Now look at the legs of Tadeo – you can hardly see them. I decided I wanted to see the legs. So I cut out the weave that was covering the leg. Now the feet can be seen. You can cut out any areas that you wish. I used a knife – but little scissors would work too. 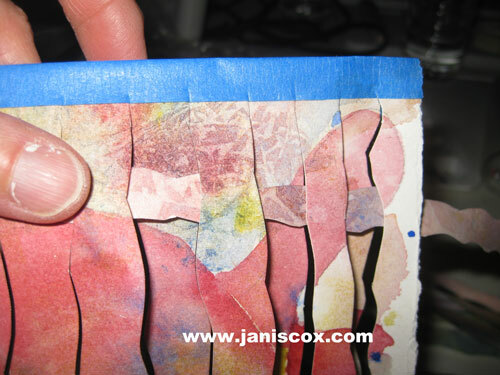 On the back use tape to hold down the pieces because once they are cut they might fall out. And there you have it Woven Tadeo Turtle. 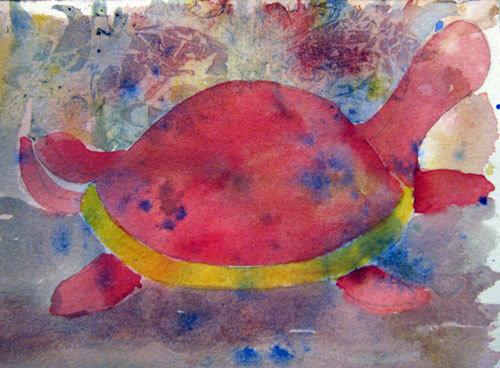 Of course, your child does not need to paint a turtle. I happen to be stuck on turtles right now. Any painting will do. I did one of palm trees. 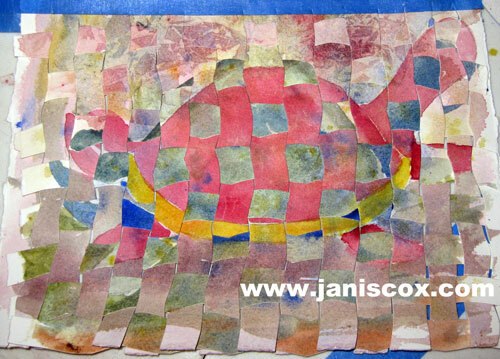 This entry was posted in Prayer and tagged craft, Crafting Saturdays, Crafts, watercolor, watercolour, weaving, woven Tadeo Turtle on April 20, 2013 by JanisCox. Fab idea! Love the use of watercolours as they have such gentle colouring. thank you. Weaving is a great skill to learn as well. What a really good idea. I will be featuring this for a Hand Development post for the Kids Co-op on the Sensory Seeker this week. Well as you can see I have not kept up with my comments. Last year at this time when all these comments were coming in we had recently returned from 6 months away. I guess I missed them all. Thanks for featuring my art idea. As always an extremely creative craft!! Janis you are the best! Love the curved lines of your weaving! Wow, Janis, what a neat idea! And your results are great! Oh, how fun and pretty! Thank you for sharing on Sharing Saturday! Thank you very much. Yes we noticed that when we wove pictures together there was movement. The palm tree picture makes it look as if the leaves were swaying. I love the water colors! Beautiful. I like the idea of a palm tree. Very peaceful. Thank you! I tried using complementary colours so add a punch. This is a beautiful piece of art work. I’ll definitely come back when we learn about turtles. My kiddos would love this project. Thank you for linking up at Home Educator Mom. That would be wonderful. I would love to feature some of your children’s work. What a wonderful, fun project! I love the finished piece! Nice to see you at Sunday Sketches. Have a great week! Great to meet you too. I am glad to have found Sunday Sketches. Thank you so much for your kind comments. I hope you become a Tadeo Turtle fan. I am so happy to find Sunday Sketches. I am looking for more art places to learn and to share. 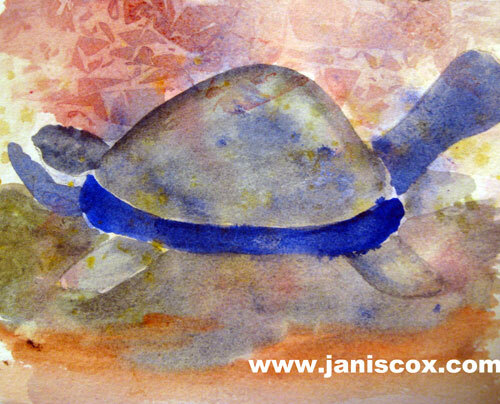 Love the process, awesome lovely turtle. I had lots of fun making this one. I hope to continue to link to Happy Paper Saturdays. 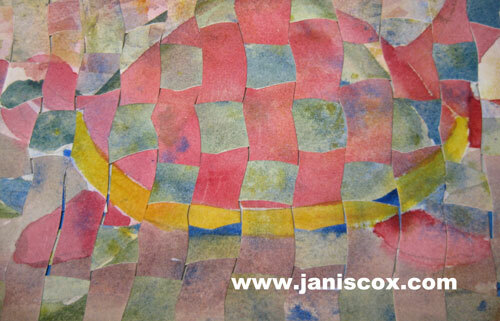 I love paper – to write and to paint and to read. Yes – I really did weave them. This is an art/craft project. What a sweet project with wonderful results!! Thanks for sharing your adorable turtles! I am laughing.. Thanks so much for your kind words. OMGoshhhhh this is just too cool. I love the process of this. Beautiful. The process and product excited me as well. I might be doing this again.